A student in the College of Arts and Sciences has received two major capstone project awards from the Renée Crown University Honors Program. 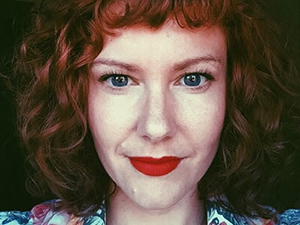 Anastasia Selby ’15 is the winner of both the David Orlin Prize for Outstanding Capstone Project and the Best Capstone Project (Creative) for the manuscript of her forthcoming novel, “The Open Curtain.” Both awards come with cash prizes, totaling $1,500. Selby decided to make the novel part her honors capstone project, enabling much of her travel and research to be underwritten by a prestigious Crown/Wise Capstone Award. As such, she made considerable headway at the Tin House Summer Writer’s Workshop at Reed College in Portland, Ore., and at the Esalen Institute in Big Sur, Calif. Probably the biggest perk was having Professor Brooks Haxton G’81 for a capstone advisor. Although Selby discarded her initial 300-page draft, she hit her stride last summer, writing six to eight hours a day, five days week. Selby hopes to finish the project—she’s currently on her fifth draft—in the M.F.A. program. “’The Open Curtain’ represents what happens after someone you love voluntarily leaves the world—how there is now a portal, an open curtain, which can beckon to those left behind,” says Selby, who has worked as a wild-land fire-fighter and nanny in Colorado, Oregon, California and Alaska. While an undergraduate, Selby juggled a variety of responsibilities, including working as a tutor for the Syracuse University Literacy Corps and as a waitress; interning at Salt Hill literary journal; and excelling as a Remembrance Scholar. She hopes to someday serve as a Fulbright English teaching assistant in India.